Her Royal Highness Princess Maha Chakri Sirindhorn, as the Representative of His Majesty the King confers the Prince Mahidol Awards for the year 2018 in the Field of Medicine and Public Health at the Chakri Throne Hall, Grand Palace on Thursday, 31st January 2019 at 17.30 hours. Total of 49 nominations from 25 countries worldwide. This year’s Laureates in the field of Medicine is awarded to Professor Brian J. Druker, M.D. and Professor Dr. Mary-Claire King, Ph.D. In the field of Public Health is awarded to Professor John D. Clemens, M.D. and Professor Jan R. Holmgren, M.D., Ph.D. Professor Brian J. Druker, M.D. Prof. Brian J. Druker made a significant research discovery in the field of targeted cancer therapy. He developed a prototype drug called “Imatinib” for treatment of chronic myeloid leukemia (CML). Prof. Dr. Mary-Clair King discovered a gene causing breast cancer, the most common cancer among women. Each year, there are over 2 million new cases of breast cancer resulting in 200,000 deaths. In 1991, Prof. King found a gene called BRCA1 in which its mutation leads to breast cancer. Therefore, it was demonstrated for the first time that the diseases can be inherited. The genetic testing can help screen people at risk of breast cancer in order to rapidly diagnose, monitor or effectively treat it at its early stages. Later, more breast cancer-related genes, e.g. BRCA2, were identified and Prof. King was often involved in those findings. However, mutations in BRCA1 remains the most common cause of breast cancer among patients. Prof. King also worked with researchers at the University of Washington to develop an affordable genetic test for breast cancer so that more people can have access to screening. The Prince Mahidol Award recognises the great discoveries by Prof. Brian J. Druker, for a prototype drug used for treatment of CML that advances the development of targeted therapy, and by Prof. Dr. Mary-Clair King, for identifying the most common and hereditable gene related to breast cancer as well as developing a breast cancer gene detection kit to provide effective screening and monitoring for people at risk. Professor John D. Clemens, M.D. Professor Jan R. Holmgren, M.D., Ph.D.
Prof. John D. Clemens and Prof. Jan R. Holmgren worked jointly for over 30 years to study and develop oral cholera vaccine (OCV). Cholera is a gastrointestinal disease due to bacterial infection. The worldwide spread, or pandemic, occurred for the first time in the 19th century, and there have been 7 pandemics till now. Millions of people have died from cholera. Injectable vaccines have been used to prevent cholera for a long period despite low efficacy. During the 1970s, Prof. Holmgren demonstrated that an important immunity against cholera is IgA produced on the mucosal surface of intestines. Thus, oral vaccines would be more efficient in inducing protection than injectable vaccines. Prof. Clemens played an important role to clinically prove the efficacy of OCV. As a result, WHO has recommended that cholera vaccines should be given orally and discontinued the use of injectable vaccines. The first OCV was called Dukoral. However, it was expensive and difficult to administer with a protection efficacy of only 50% and only lasted 2 years. During the 2000s, Prof. Clemens and Prof. Holmgren produced a new OCV known as Shanchol. This new vaccine was cheap and provided a protection of up to 5 years. In addition, they demonstrated the concept of “herd immunity” by which providing vaccinations to at least 60% of the population can prevent on outbreak. This is because the vaccinated population can reduce incidences of disease so that the unvaccinated population would have much less of a chance of contracting the disease. Therefore, diseases can be controlled even not all of population are vaccinated. With this concept, WHO has recommended Shanchol vaccine for countries struggling to control cholera since 2010. In 2013, WHO and GAVI established an OCV stockpile to prevent a spread of cholera especially when there is a threat or a disaster-level situation. For example, the use of OCV among several hundreds of thousands of people in Haiti after hit by Hurricane Matthew in 2016 and in Bangladesh after a heavy influx of Rohingya following the migration crisis in 2017 was believed to have helped prevent an epidemic of cholera. A significant discovery from basic research and clinical test regarding vaccines against cholera has been approved by WHO. Prof. John D. Clemens and Prof. Jan R. Holmgren have made a great impact by recommending that cholera vaccines, be provided orally rather than injected. This also led to the establishment of an OCV stockpile to support countries at risk of or affected by the spread of cholera to help save the lives of millions of people worldwide. The Prince Mahidol Award Foundation under the Royal Patronage was established in commemoration of the centenary of the birth of His Royal Highness Prince Mahidol of Songkla, on 1 January 1992. 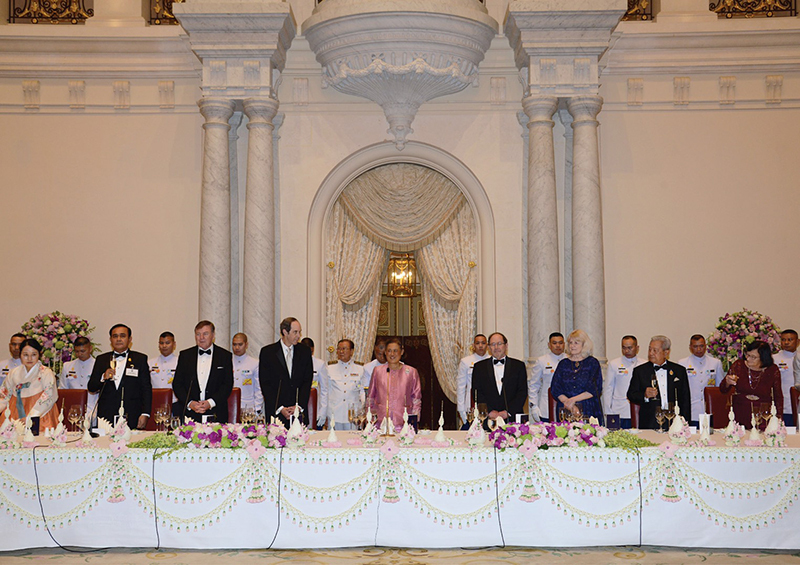 The Foundation is under the Royal Patronage, with Her Royal Highness Princess Maha Chakri Sirindhorn as President. The Foundation annually confers two Prince Mahidol Awards upon individual(s) or institution(s), which have demonstrated outstanding and exemplary contributions to the advancement of the world’s medical and public health services. Each Award consists of a medal, a certificate and a sum of US $100,000. In the past 27 years, 79 individuals, groups of individuals, and institutions had received the Prince Mahidol Award. Among them, 5 subsequently received the Nobel Prize. More importantly, 1 of the most the recent Nobel Prize (2015) laureates in physiology or medicine were conferred the Prince Mahidol Award prior to their continual prestigious recognition1 Prince Mahidol Award Laureate was elected as Director-General of the World Health Organization (WHO) and 4 Thai Prince Mahidol Award Laureates. 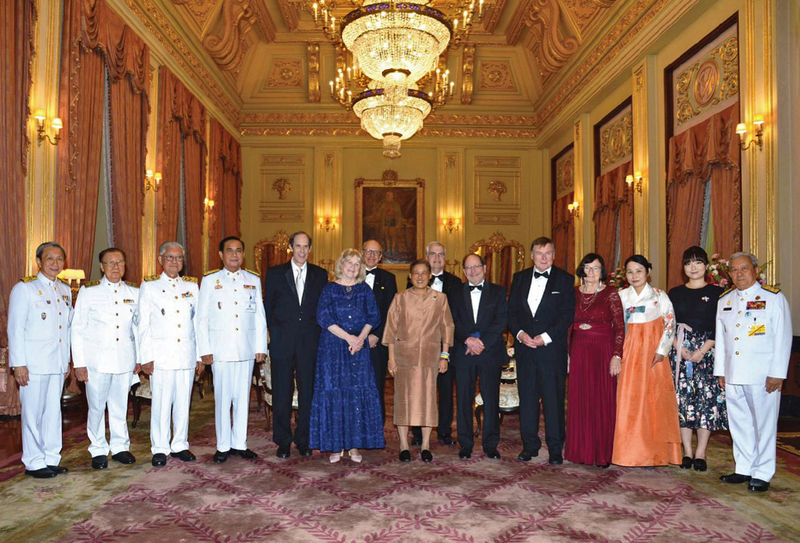 Following the Presentation Ceremony of the Prince Mahidol Award 2018, Her Royal Highness Princes Maha Chakri Sirindhorn represents His Majesty the King will preside over the dinner in honor of the Laureates and spouses at the Boromarajasathitmaholarn Hall at 19.30 hours. On Friday, February 1, 2019, H.R.H. Princess Maha Chakri Sirindhorn will chair the opening session of Prince Mahidol Award Conference at Centara Grand & Bangkok Convention Centre at CentralWorld. 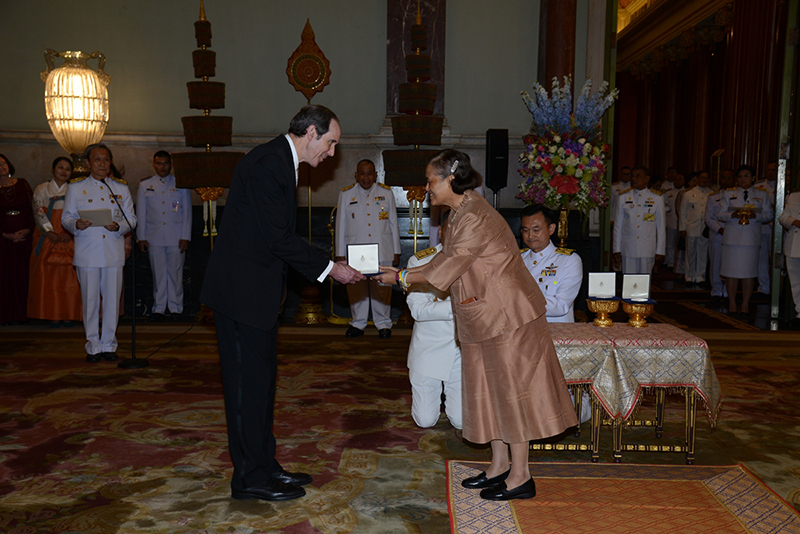 Thursday, January 31, 2019, Her Royal Highness Princess Maha Chakri Sirindhorn, represented His Majesty the King, presented the Prince Mahidol Award for the year 2018 in the field of Medicine to Professor Brian J. Druker from the United States of America, at the Chakri Throne Hall, Grand Palace. 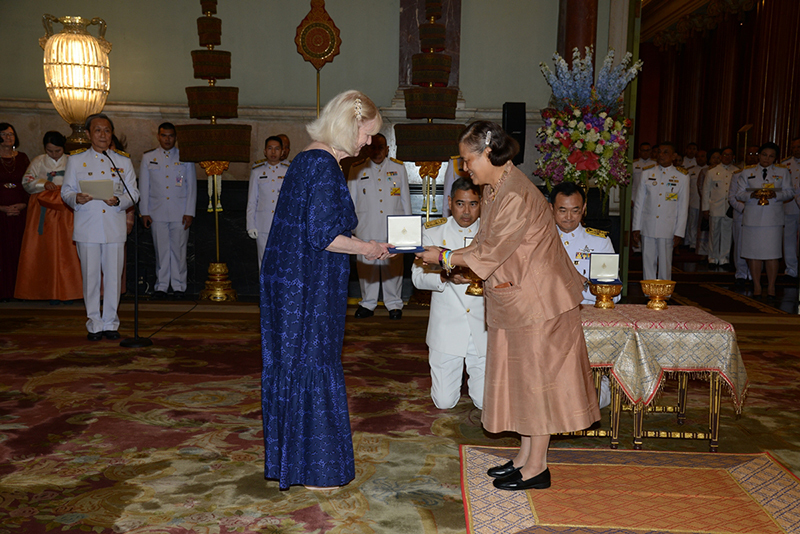 Thursday, January 31, 2019, Her Royal Highness Princess Maha Chakri Sirindhorn, represented His Majesty the King, presented the Prince Mahidol Award for the year 2018 in the field of Medicine to Professor Dr.Mary-Claire King from the United States of America, at the Chakri Throne Hall, Grand Palace. 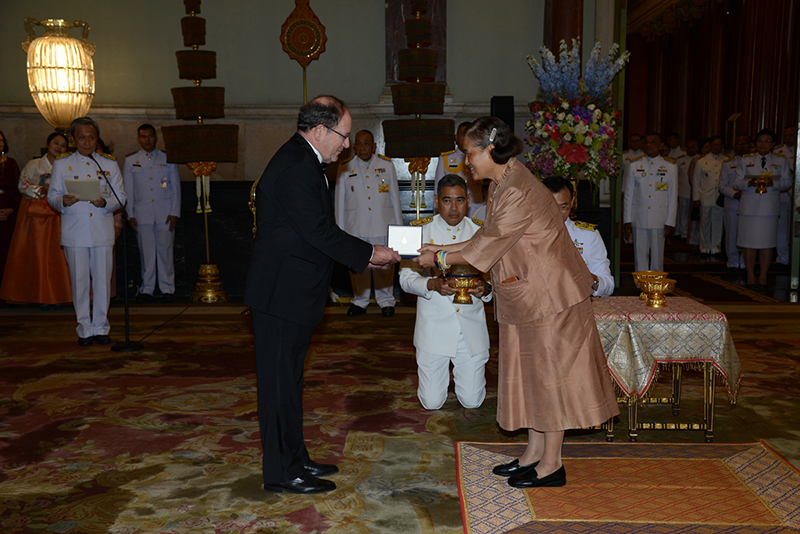 Thursday, January 31, 2019, Her Royal Highness Princess Maha Chakri Sirindhorn, represented His Majesty the King, presented the Prince Mahidol Award for the year 2018 in the field of Public Health to Professor John D. Clemens from the United States of America, at the Chakri Throne Hall, Grand Palace. 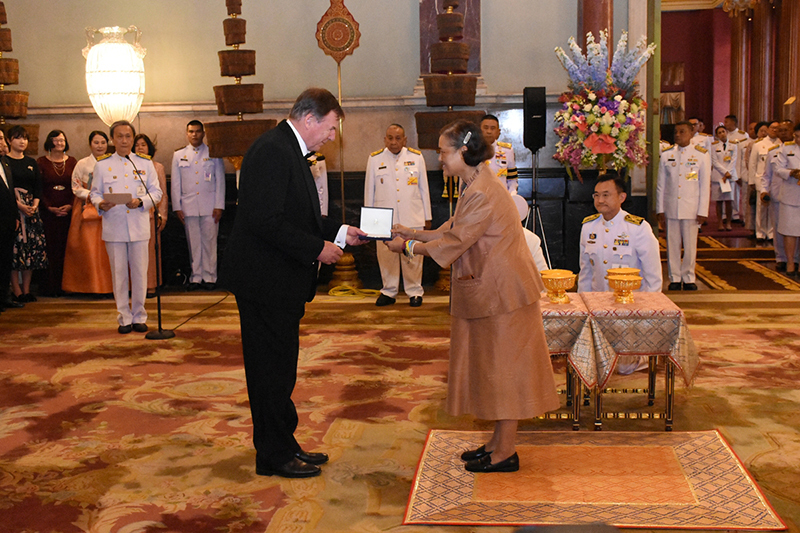 Thursday, January 31, 2019, Her Royal Highness Princess Maha Chakri Sirindhorn, represented His Majesty the King, presented the Prince Mahidol Award for the year 2018 in the field of Public Health to Professor Jan R. Holmgren from Sweden, at the Chakri Throne Hall, Grand Palace.